We have seen that there is a lot of literature out there proving us that Intermittent Fasting (IF) can help us to lose weight, reduce inflammatory levels and maintain muscles while fat is burned. On the same page, a healthy Microbiome has similar effects. Logically, a fast for a prolonged time has an effect on our microbiome, as we give our microbiome an extended time to rest. Calorie-restriction has long been shown to lengthen the lifespan in various animal models, including monkeys, which are very similar to us humans . The mechanism behind it is still debated in the scientific community but maybe the microbiome has his cards in the play here as well. A research group from China took a new approach and analyzed the effect of a life-long calorie-restriction on the composition of the microbiome . They found that regardless whether they looked into a low- or high-fat diet, the calorie-restriction significantly changed the microbial gut composition. The beneficial bacterium Lactobacillus species, which is thought to protect the body against pathogens, reduces inflammation and increases the lifespan, was higher abundant in calorie-restricted mice than in their normal-fed siblings. On the other hand, "bad" bacteria that are correlated to inflammation like Stretococcacae species were reduced. 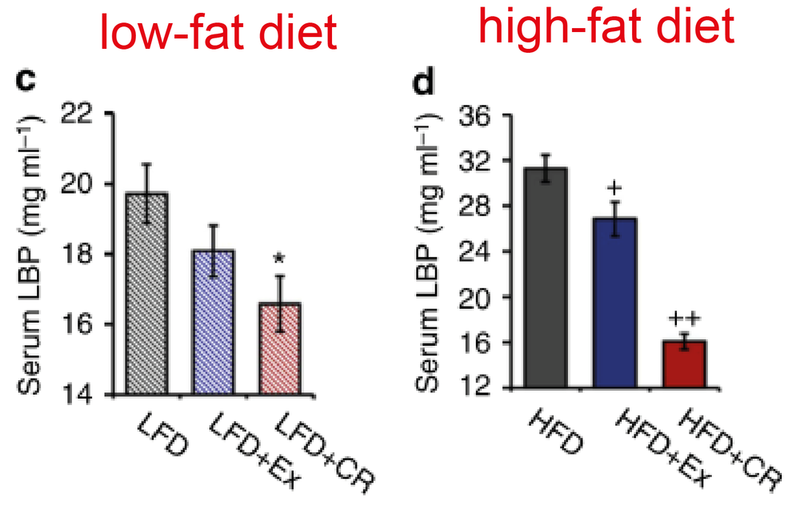 As the figure below shows, calorie-restriction itself was extremly efficient to lower blood endotoxin levels (LBP). Endotoxins are molecules present on the cell wall of bacteria and induce a strong inflammatory response. High blood endotoxin levels indicate a leaky gut, which is strongly connected to many diseases! In fact, calorie-restriction was more effective than exercise in terms lowering inflammation levels. Another study conducted in Austria gathered obese patients and set them on a fasting diet for one week. The results showed that fasting by itself increased the diversity of their microbiome! In particular, fasting increased the species of Enterobacteria and our previously seen Lactobacilli species, which are both associated with an improvement in inflammation levels. The researchers also observed an increase in Faecalibacterium prausnitzii, a dominant producer of the short-chain fatty acid butyrate . The list of health benefits from short-chain fatty acids is long and again interconnected to IF and the microbiome! These to studies give us a first indication that IF and the microbiome are connected in some kind of "healthy cycle". As IF already provides benefits like reducing inflammation and weight loss, it has the potential to change the microbiome in a way that it supports a healthy shift in gut bacteria composition, which in turn supports to lose weight and reduces inflammation.